Pop Art as an insult to the intelligence. 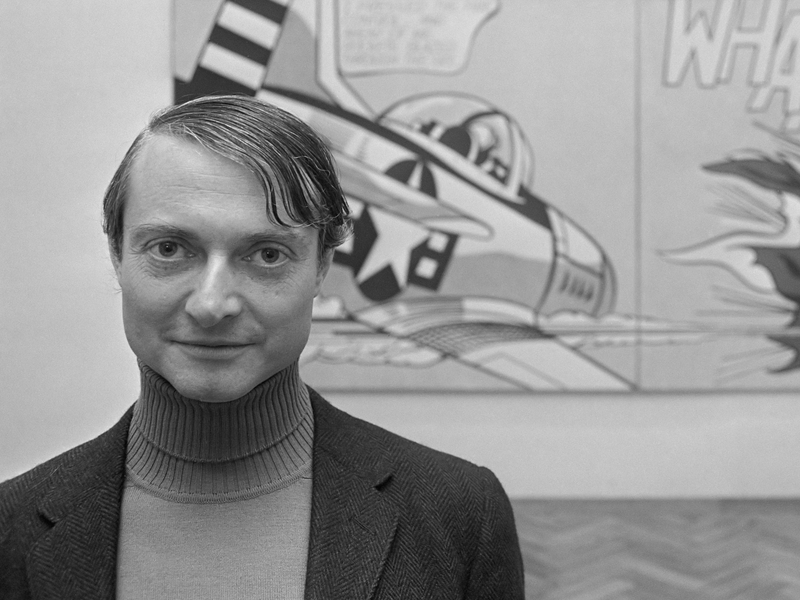 Roy Lichtenstein, in 1967, at the Stedelijk Museum in Amsterdam. Photo via Wikimedia Commons. Roy Lichtenstein was a prominent figure in the Pop Art movement of the early 1960s, appropriating themes and forms from comic strips and other ostensibly low-brow media. Max Kozloff, who wrote the following consideration of Lichtenstein (November 2, 1963), was The Nation’s art critic from 1961 to 1968. Lichtenstein has already become notorious for his pedantic explorations of the world of “funnies” and the mail-order catalogue. In them, like a Marxist theorist, he demonstrated a logic of approach that has brought many of his less “advanced” colleagues into an almost party-line consciousness of their direction…. By making the most thoroughgoing of his borrowings, Lichtenstein has arrived at the “purest” distillation of his thought. One has no other choice but to read his finished product, not as performance, for there is none, but as intention, idea…. The tendency of Pop Art, unfortunately, is to grab the spectator by the collar whenever he tries to obey his natural instincts by looking at art as one human being confronting the work of another, and to stuff him back into an airless envelope of contexts. Worse still, all that really counts any more are the contexts and intentions, not the execution and the results. I find it hard to get excited by Lichtenstein’s appeal to my special knowledge; still less can I summon up interest for his insult to my general intelligence.